I believe that there is a small bug in the automatic bookmark creation, when a PDF file is dragged from Windows Explorer into an existing PDF file. When there is an existing PDF file open in PDF-XChange Editor, one can insert another PDF into it by simply dragging the other PDF file from Windows Explorer to the desired place between the thumbnails in the existing PDF file. Then, a new bookmark automatically will be created, using the file name of the dragged PDF file, which is great. However it seems that most of the time, that new bookmark does not point to the first page of the newly inserted file, but instead to the (previously existing) page behind the new file -- which is very confusing. Thanks already to the team for cross-checking and, if applicable, filing a ticket for this issue. While this potential issue is fixed, another small change maybe could be made to this feature: use the dragged PDF file name for the new bookmark, but leave out the .pdf extension in the bookmark. It would be even better if the bookmark that is automatically created would be inserted between any existing bookmarks at the correct place. At the moment it seems that the new bookmark is always created at the very end of the bookmark list/pane, no matter to what page in an existing PDF an external PDF file had been dragged to. Last edited by David.P on Thu Sep 15, 2016 9:59 am, edited 3 times in total. We will sort it out as soon as possible. It would be a FANTASTIC feature if external documents could be dragged also directly to the bookmarks pane. For example, imagine you have a PDF file with a number of bookmarks pointing to different pages (say, to different letters, or chapters) contained in that file. Now you need to add another document (i.e. another letter with a couple of pages) at a specific place inside the exisiting PDF. It would be SUCH a work-saver if that new letter simply could be directly dragged (from Windows Explorer) to where it belongs in the PDF file (i.e. 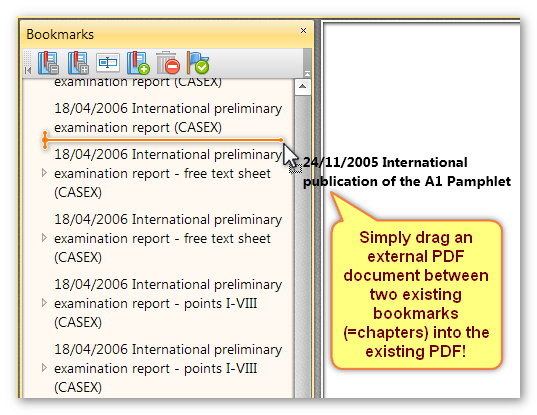 between two existing bookmarks), and in doing so, would be inserted just before the first PDF page of the subsequent bookmark! I do not believe this is possible (to drag to bookmarks pane) as there are several cases in which there won't be a single logic that can be applied. E.g. - you could have bookmark 1 pointing to page 3 and then bookmark 2 pointing to page 1 - it's perfectly possible and not forbidden by the specification. You could have a bookmark pointing to an external resource (file, web address, etc.) and if you try to place new content "above" that - where should the pages go? Yes - in most cases bookmars are used as Table of Contents - but they are not restricted to only such use. There is just too much possible uncertainty for this to work properly, while when dragging between two specific pages in the existing file - there's no ambiguity at all. Thank you Stefan, for your important thoughts on this. And if there should be no subsequent "proper" bookmark present in the existing file, the dragged pages are simply inserted at the end of the file. Therefore, with a simple logic like above, this paperless office killer feature (available nowhere else) could be implemented rather easily in my view. 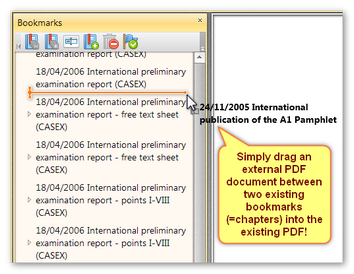 Further, this would also solve the problem that currently, when an external file is dragged from Windows Explorer into an existing PDF file (between its thumbnails, the only possible way at the moment), the file name and/or any bookmarks contained in the external file are added at the bottom of the bookmarks pane (i.e. behind the last bookmark). When there are lots of bookmarks (I work with files having hundreds of bookmarks on a daily basis) it is very awkward to actually drag or cut/paste the inserted file's name and/or bookmarks to the proper spot between the existing bookmarks afterwards. 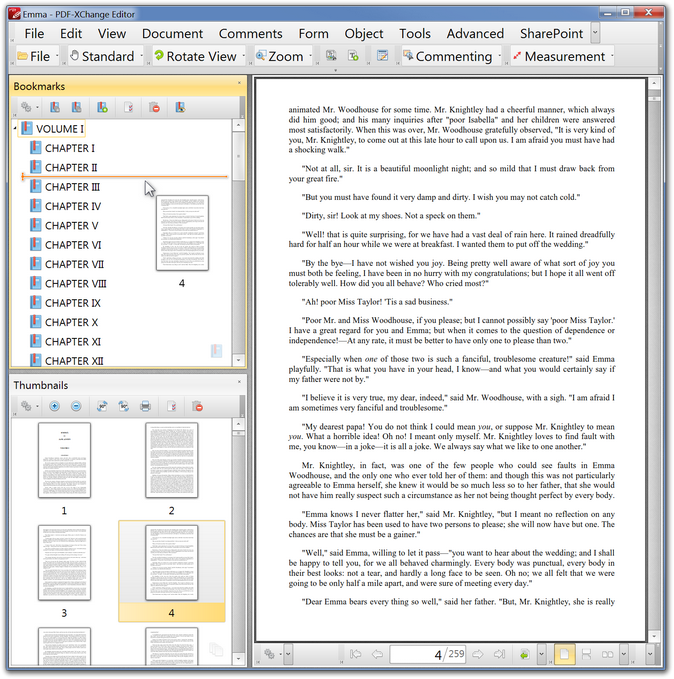 Not to mention that it is difficult and error-prone to locate the proper two thumbnails between which the external file must be dragged, before dragging the file in the first place; and the fact that both thumbnails and bookmark panes must be open to carry out such "chapter insertion" by dragging external files. These problems would all vanish into pleasure/thin air with this feature. Thanks for the detailed explanation. I still believe this will cause more trouble than it will help - but will ask our devs to take a look at the topic and consider this request. This is not a promise that we will actually approve or implement it at all. Also - you can have the thumbnails and the bookmarks panes opened one above the other if you need to see both at the same time - as per the attached screenshot. I normally have my bookmarks and thumbnails panes at the bottom and signatures and contents at the top - but I've moved the bookmarks pane up just to show you it's possible for you to arrange those panes and separate them. Tracker Supp-Stefan wrote: will ask our devs to take a look at the topic and consider this request. Yes, pleeese Stefan. This would be an incredible feature for paperless file work, especially in the legal field (probably also in engineering). Tracker Supp-Stefan wrote: Also - you can have the thumbnails and the bookmarks panes opened one above the other if you need to see both at the same time - as per the attached screenshot. First, you have to click on a bookmark to jump to the desired spot where you want the pages inserted. Then you have to look up and remember the page number of the current page in the thumbnails pane, before (or after) which you want to insert the additional file. Then you drag the file from windows explorer above (or under) the page you just remembered in the thumbnails pane. The file now gets inserted. But its file name, and its own additional bookmarks are inserted incorrectly: after the last existing bookmark of the open PDF file. Therefore, using drag and drop (difficult with so many bookmarks) or cut and paste, you have to move the added file name and/or added bookmarks to the (hopefully correctly remembered) precise spot in the bookmarks pane. Therefore, thanks heaps for making this an official feature request if at all possible! You made this feature request into reality in no time, and turned it into an obvious piece of programming art at the same time. I can't tell you with words how valuable this is. I just tested this feature with build 316, and -- it is absolutely amazing. Drag-and-drop-inserting of external PDF files simply and directly between the bookmarks of an existing PDF -- another world's first and killer feature of PDF-XChange Editor. On a quick note, this feature still is absolutely priceless, almost magic, in comparison to the complicated process before (which the competitors still require of course). I.e. when Ctrl-deleting a bookmark, all pages starting from that bookmark up to the last page before the next page that has a bookmark assigned to it would be deleted as well. Or, when Alt-dragging-dropping a bookmark, all pages starting from that bookmark up to the last page before the next page that has a bookmark assigned to it would be dragged-dropped as well. That would be another killer feature, for example for working with long paperless project files in PDF form that can easily contain thousands of pages and hundreds of bookmarks. When inserting an external PDF file by dragging-dropping it between bookmarks (or into the bookmark pane, generally), the file extension (i.e. ".pdf") should be omitted for the creation of the related new bookmark. Currently, the file extension always seems to turn up after the name of the file that is inserted in a PDF this way. Last edited by David.P on Wed Jan 27, 2016 8:22 am, edited 1 time in total. Well currently the Editor behaves like that when Inserting pages, Bookmarks etc, and I don't know whether it would be better to write the extension or not - because it's handled in one place. Sasha - Tracker Dev Team wrote: Well currently the Editor behaves like that when Inserting pages, Bookmarks etc, and I don't know whether it would be better to write the extension or not - because it's handled in one place. Understood... In my view I can't see any scenario where one would want the *.pdf extension in a Bookmark or for inserted pages. Anyway, this is a minor issue. I still can not praise this feature enough. I am using it all day long every day and it saves me so much time and effort. Recently I found that it is not only possible to drag RTF files directly from Windows Explorer between existing bookmarks of a PDF file, in order to insert the RTF directly as PDF pages -- this even works with Word files. Unbelievable! Since this all is almost like magic, I'd like to propose another small extension of this feature. It would be very helpful if it would be possible to directly drag pages selected in the thumbnail pane between existing bookmarks of the same file (or of another file), in order to rearrange the pages. At the moment it is only possible to drag pages within the thumbnail pane. However, it can be very difficult to determine the target for dragging within the thumbnail pane, both because this usually requires scrolling the thumbnail pane (while at the same time holding the mouse button down), and because it is difficult to see in the thumbnail pane whether you have arrived at the correct page where you want to drop your selected thumbnails. This would be so much easier if the pages collected within the thumbnail pane could be directly dragged between the respective bookmarks that resemble the target for the dragged pages. This way, it would be made incredibly easy to rearrange pages, or especially page ranges, within an existing PDF file. Since this probably is only a rather small extension of the already existing feature of dragging pages between bookmarks, it should be not so difficult to implement in my view. Thank you already for consideration! 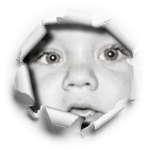 Last edited by David.P on Wed Feb 13, 2019 7:05 pm, edited 5 times in total. I will investigate whether this would be difficult to implement and, if possible, will add this feature into one of the future releases. It would be preferable if you could write more complex description of the page dropping part so it will be easier to understand the overall logic. Hello Alex and thank you for your fast reply! The logic would be the same, in principle, as laid out above with respect to the dragging of external files. Below I have only reworded the above logic in order to fit to the present proposal. Therein, I additionally propose to create a temporary bookmark for the dragged pages after the dragging. This way, the user can decide whether he wants to rename the temporary bookmark, in order to create a new bookmark for the dragged pages, or whether he simply wants to delete the temporary bookmark. And if there should be no subsequent "proper" bookmark present in the existing file, the dragged pages would be simply inserted at the end of the file. Another question would be, what happens when the dragged pages have bookmarks already assigned to them. In this case, of course the bookmark targets assigned to those dragged pages would be relocated as usual, when dragging pages within the same file. Additionally, those existing bookmarks themselves could also be relocated within the bookmark pane along with the dragging of the pages. However, I think that this would be too confusing, therefore I would propose to leave such bookmarks (if any) where they are. The user then still can decide whether he wants to also manually relocate those bookmarks afterwards. Alternatively, for relocating entire page ranges that already have bookmarks assigned to them by dragging the respective bookmarks, I refer to my earlier proposal above. Last edited by David.P on Thu Aug 11, 2016 2:29 pm, edited 2 times in total. Thanks David, will pass that along to Alex. The feature is now implemented (see attachment gif) and will be available from the next release. I am eagerly looking forward to trying this feature in the next release! Great work! The feature is available in v.318 now. Amazingly, any selection of pages now can be rearranged by simply dragging them from the thumbnails pane between existing bookmarks in the bookmarks pane! This is incredibly useful for working with long documents. 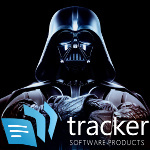 Thanks to Alex and the Tracker team for listening and for implementing this great feature! Last edited by David.P on Wed Sep 14, 2016 2:08 pm, edited 1 time in total. Glad to hear you like it David! Aahhg Stefan, I just found that a new bug has been introduced regarding the "drag files between exisiting bookmarks" feature! - drag an existing PDF file from Windows Explorer between the bookmarks for "page 2" and "page 3"
- see that the dragged PDF file ends up starting with page 4 in the open document. Expected behavior: the dragged PDF file should end up in the open document starting on page 3, because it has been dragged before page 3. I see what you mean. 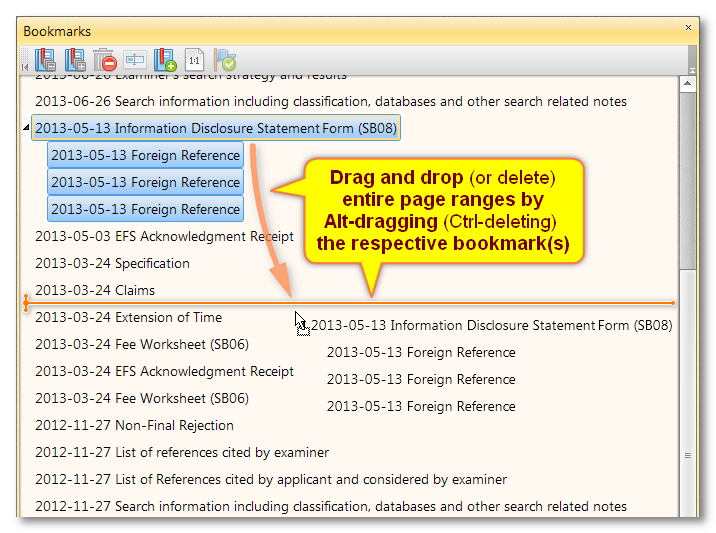 The Bookmark pane shows it as between 2 & 3 but in the document itself it is between 3 & 4. There were a lot of changes and additions in 318 so it is possible that there may be a 318.1 in the not too distant future if there are a few more little things like this that need to be fixed. That's not a promise at this point though. PS - that's a nice little charger. Does it also do LiPo? Thank you Paul, for creating a ticket for this and for passing it on. 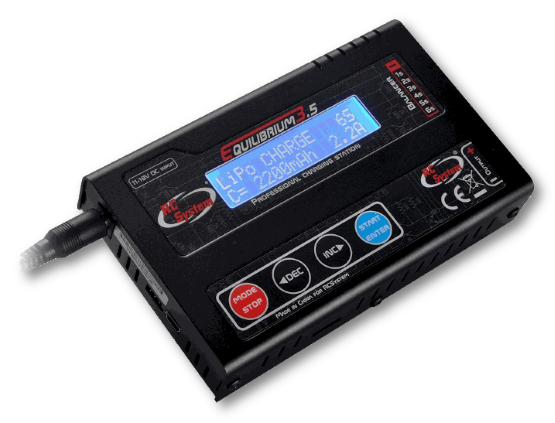 It does LiPo, LiFe, LiIon, NiMH, NiCd and PB. What's more, it doubles as a lab power supply with adjustable U and I. Apparently you can even record charging graphs etc. using USB via PC. I double checked that and it seemed that a small bug occurred while the code was updated to the new features. It is fixed now and should be available from the next build. Thank you Alex, that's great to hear. Could I quickly fix this in build 318 exe using my hex editor? Sweet box David. I think I'll grab one of those. Thanks for the heads up on it! David.P wrote: I just found that a new bug has been introduced regarding the "drag files between exisiting bookmarks" feature! I am happy to see and report that this issue has been resolved in the latest build! Thanks to the Tracker team for the quick action! Great work! [...] Amazingly, any selection of pages now can be rearranged by simply dragging them from the thumbnails pane between existing bookmarks in the bookmarks pane! This also works for dragging thumbnails between two different PDF documents. In other words, PDF pages (or page ranges, or random page selections) can be dragged from the thumbnail pane of one PDF document into the bookmarks pane of another PDF document, and dropped there at a target location directly between existing bookmarks. The dragged pages will then be inserted at that target location. More specifically, the dragged pages will be inserted just before the page which the bookmark under the dragging target points to, and a new, empty bookmark will be created at the target bookmark location. However, there is one small glitch with the bookmark that is created in the target document (only when dragging between different PDF documents): Currently, that bookmark will have no actual target where it points to (while it obviously should point to where the dragged pages have been inserted). Thanks for having a look into this small issue! As per usual, you can ask any member of the support team for an update down the road! Thank you Daniel, for reproducing the issue, and for the fast action! I just discovered another minor problem with the dragging of pages between bookmarks (still a priceless unique feature that I use every day all day long). If some pages are selected in the thumbnail pane and then dragged and dropped behind the last bookmark of the file, then it seems that the pages are moved to the beginning of the file (instead of to the end of the file where you'd actually expect them to end up).